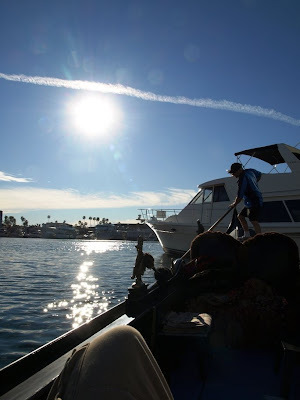 As is often the case, I arrived for a pickup at the Villa Nova restaurant, ready and eager to row in the wind that was whistling through the harbor. My passengers called and said that they were running about 20 minutes late, so I grabbed my camera, set up the tripod, and played around with the long exposure feature for a while. 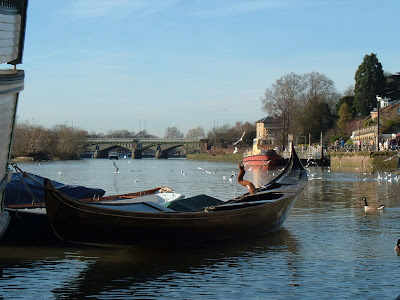 This photo was recently taken in Richmond, England, near London. 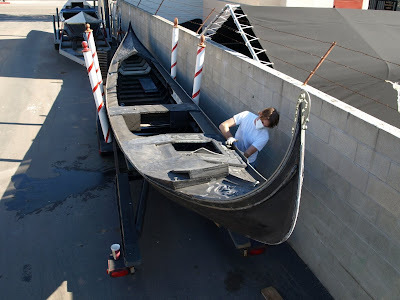 The gondola is in the process of restoration, hopefully being prepared to take passengers there in the spring. 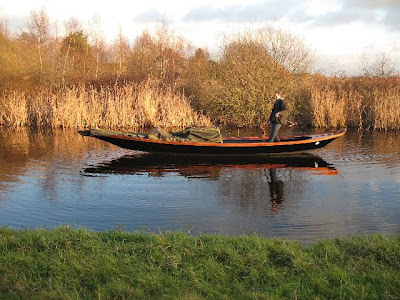 In the past, the gondola was owned by a cafe on a lake in a small park in London. 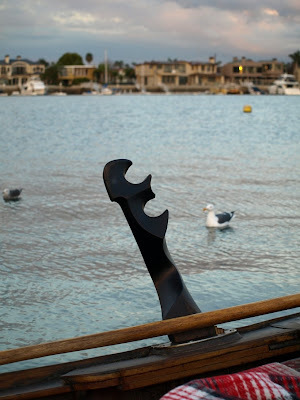 The folks restoring the boat are working on getting a new ferro for her. They opted to carve their own forcola rather than buy one from a remer in Venice - certainly a cost-saving move, in a year or two they'll know if it was worth it. 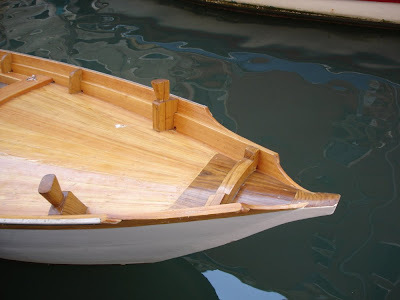 As for me, I'd sooner fabricate the whole boat than go with a non-Venetian forcola. 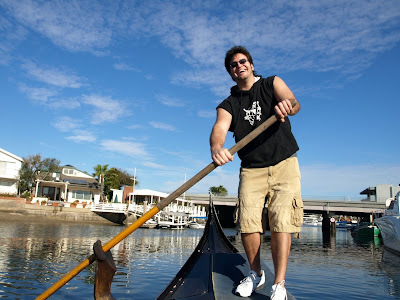 I checked with Nick Birch who operates his own gondola in Stratford, England. Nick tells me that the lake this gondola was on previously was in Battersea Park. I've heard from a number of people that she was in derelict condition before the current owners got ahold of her, and that they've done a good job with her so far. I love to see restorations like this. My compliments to the new owners on their efforts. I encourage them to see things through. Maybe when I finally get out to London, I'll try out that forcola myself. I was in Long Beach today to buy a bike. 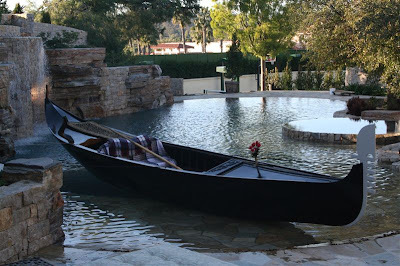 I had some time so I dropped by the Gondola Getaway. 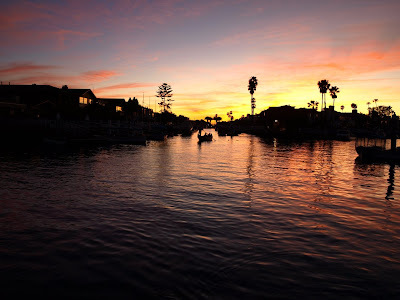 I had a great conversation with John Synco, met gondolier Ian McCabe, and did my best to capture some good images in the fading light of the early evening. bringing the boat around before the cruise. Well, she's not actually his Sampierota, but he sent the photos, and she's a beauty. Bob also related a funny story about the boat. 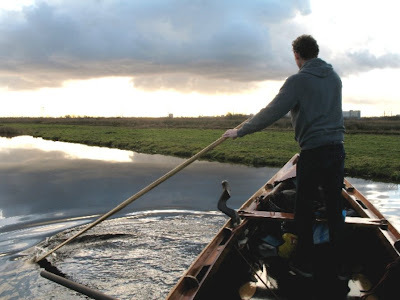 He was in a residential area of the Dorsoduro, along the Rio de le Romite, not far from Ponte delle Turchette. 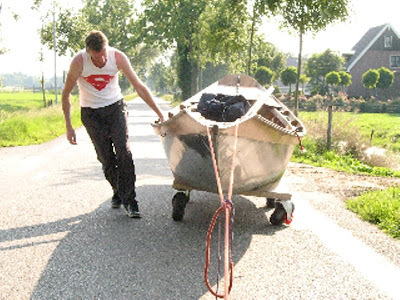 "One day when passing by, a delivery topa was squeezing its way along the rio, being very careful about the boats moored on both sides. The owner of this Sampierota rushed out of his house and "had words" with the operator of the delivery topa. 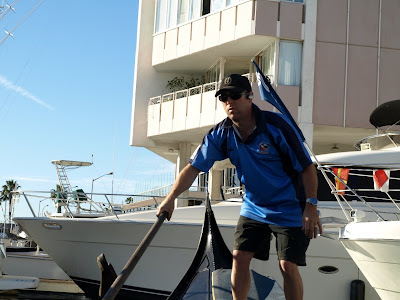 The owner retreated after insuring his boat was left unharmed." 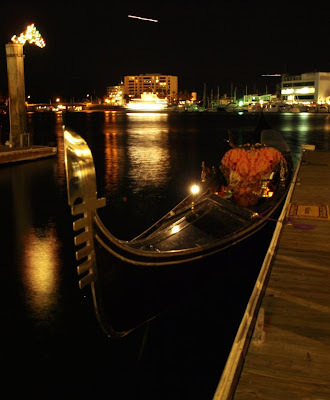 The Sampierota is a great example of the Venetian way of thinking. Most of us have seen them, either in person or in paintings and photos. 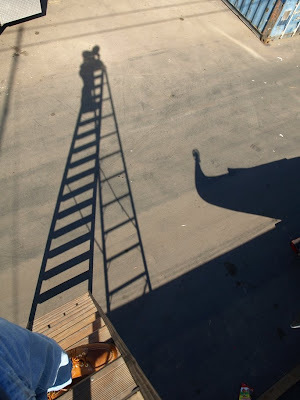 They often have painted sails. 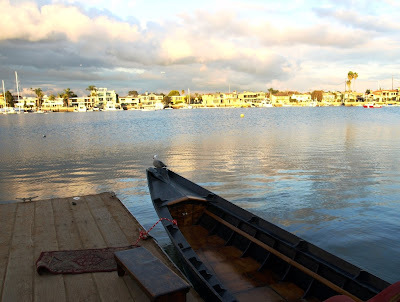 Their shallow draft gives them the ability to sail in parts of the lagoon where other sailboats would run aground. 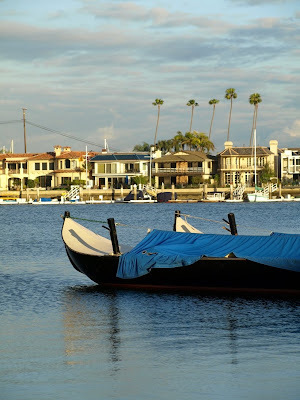 Like the Venetians, she adapts to her surroundings, and thrives because of it. But there are other reasons this design has lived on while so many other types have become "extinct". and in many cases big enough for light cargo carrying if necessary. 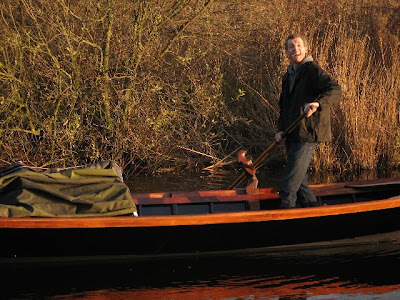 and has a stern which easily accepts an outboard motor. When Bob first sent me these photos, I wasn't sure if she was a Sampierota or a Topa - the two designs share many traits. 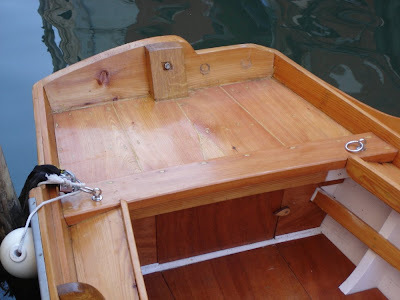 I asked Nereo Zane and he indicated that the boat was a Sampierota. An e-mail from Gilberto Penzo confirmed the same answer. 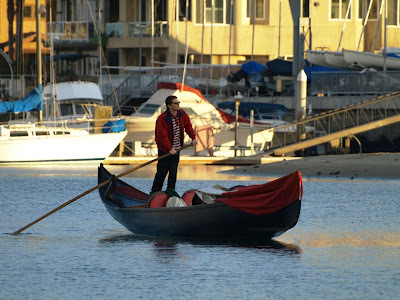 When I'm in Venice this May, I might just try and find this boat to get a closer look. She looks immaculate. I just wish I could have been there to see the owner "have words" with that delivery driver. Thanks Bob, for the photos and great story. Several years ago this rare Venetian craft ended up on E-bay. I was intrigued, and investigated her. 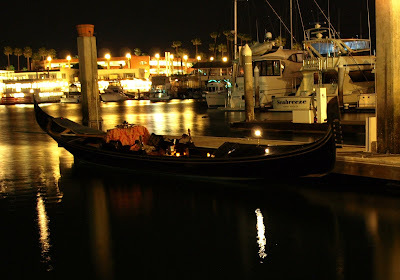 By the photos, she looked just like a standard, Venice-built gondola, maybe a little fancy in the parecio, and the carvings on the deck were a bit more dramatic. 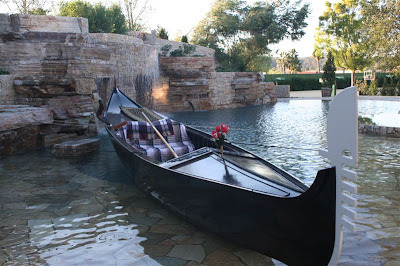 Otherwise all the details were there, but the auction description said that the gondola was about twenty feet long. 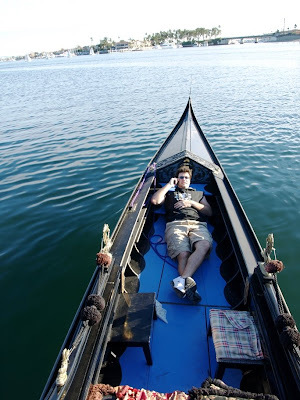 Then I looked again at the photos and noticed that while the boat resembled an eleven-meter gondola, the background seemed off. 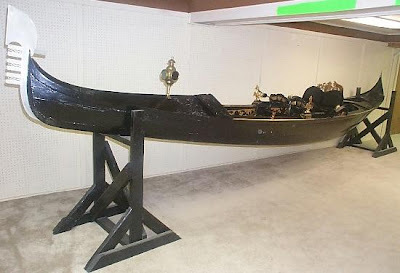 There was no way a full-size gondola would fit in a garage, or a room with a ceiling of normal height. 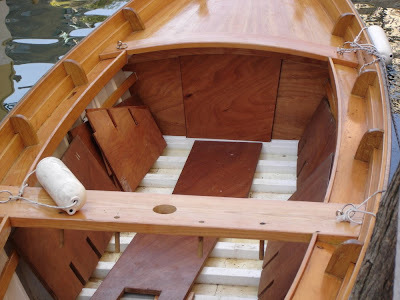 Everything is half-sized on this boat - even the ferro is a miniature version of the standard design. 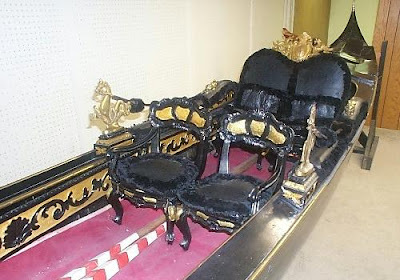 no, this was a Venetian gondola. 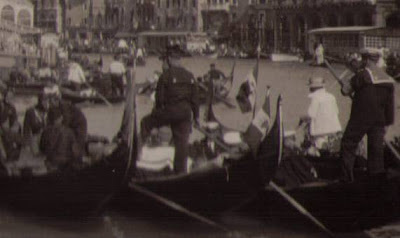 The Tramontin family built a limited number of these half-sized gondolas in the early part of the 20th Century. They were used mostly in parades - children would ride as passengers, and young boys would row in full costume. I've seen a picture of it, and yes, it's the cutest thing ever. look at all that half-sized stuff. Rumor has it that the Tramontin squero built a half-dozen of these vessels. 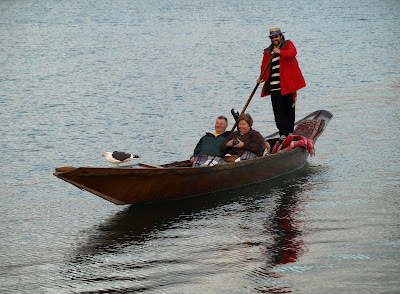 I've heard that other half-sized gondolas may have been built in earlier centuries, but I haven't been able to confirm that. The boat, while unique and very rare, can't really be used for passenger service (except for kids, and we don't get many requests like that). These were intended to be fully functioning scale models, but too small for normal use. 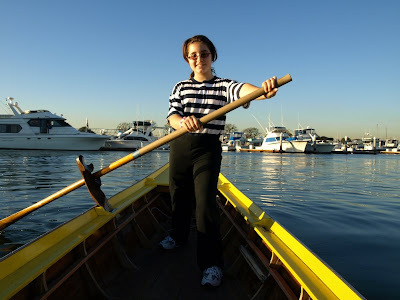 A skilled gondolier, who's not very big, could probably row the boat, and two passengers might be able to sit facing each other, but those are a lot of what-if's. 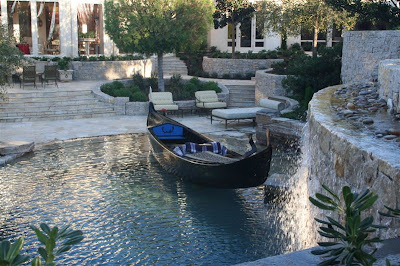 I wanted the boat, but it wouldn't pencil out - storage alone would cost more than I could justify. 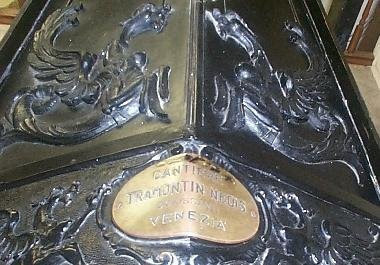 The brass plate indicates that the gondola was built when Nedis was in charge of the Tramontin squero. 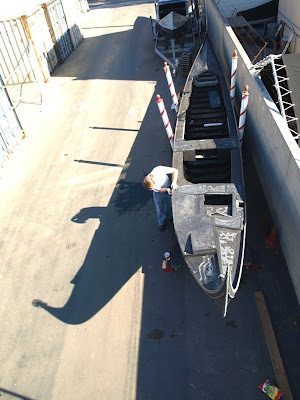 Via e-mail, Gilberto Penzo urged me to buy the half-sized gondola, but with a new baby and a bunch of other boats to maintain, I had to let her go. 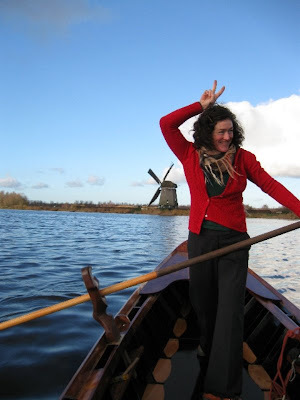 At the time of auction, the boat was in the US - I can only guess how she ended up here. but with any luck she will end up in a museum where we can all see her. This may very well be my favorite postcard of them all. It's the only one I keep framed and on display at home. The image is a classic example of the monochrome photo that's been colorized. This was a popular process that gave us a multitude of great postcards before the full-color-process was developed. 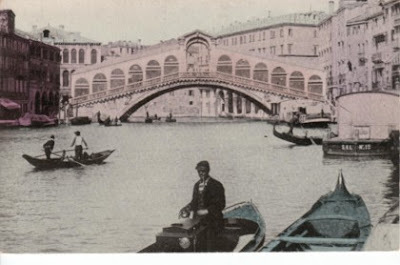 The centerpiece is supposed to be the Rialto Bridge, but that's not why I keep studying the image (I probably look at this card two or three times a day). It's all the boating activity that makes the card special. I often wonder what the two guys are talking about in the mascareta. The guy in front has turned to his left to look back at the popier, who is leaning forward as if he's listening intently. 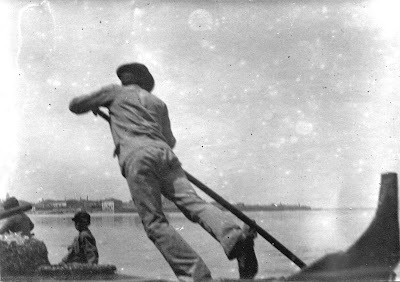 The guy in the foreground is standing in the only motorized boat in the shot. He's probably the captain, but he isn't currently steering (he's on the wrong side of the console for that). Our captain seems to have a pipe in his mouth and is the only one in the shot who knows he's being photographed. To the right, we see two vaporetto platforms and a gondola disappearing between them into an area that is still a mooring place for our favorite boats. 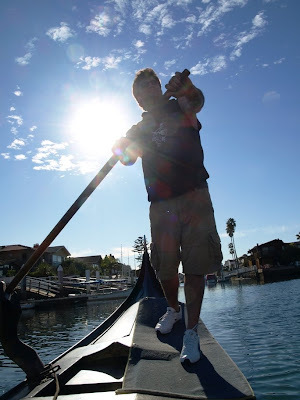 The gondolier seems to be leaning forward as if he's wondering "who the heck is in my spot?" 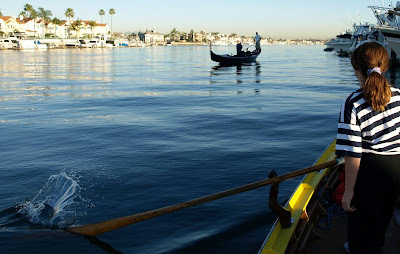 Then there are some other boats in the background - gondolas and other types. 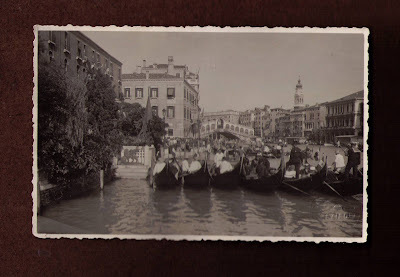 I like this postcard because it's a snapshot of life on the Grand Canal long ago. 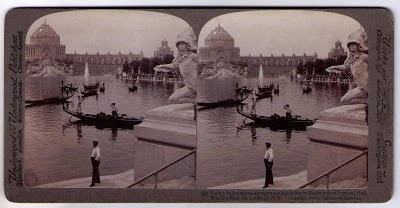 I'm not sure when it was taken, but it sure wasn't as crowded then as it is today. One of the things I really enjoy watching is an expert who is totally "in his element". 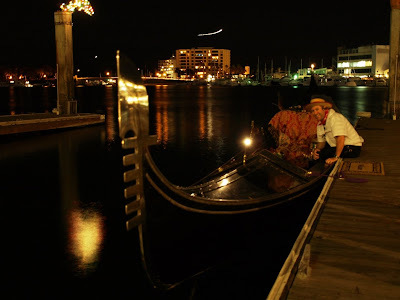 A perfect example is the gondolier bringing the boat into dock - his dock. By the time I get to see it, he's done it hundreds of times. 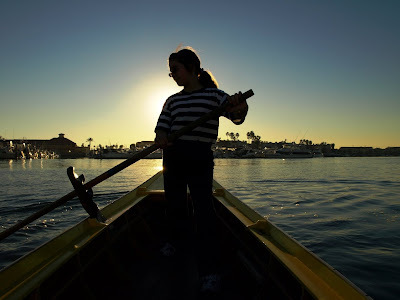 When Cassandra and I were rowing the sandolo at Sunset Gondola, we witnessed such a docking. Tyson came in and "stuck the landing" like it was nothing. I've seen both he and Tim dock there before and it's always the same - like second nature. 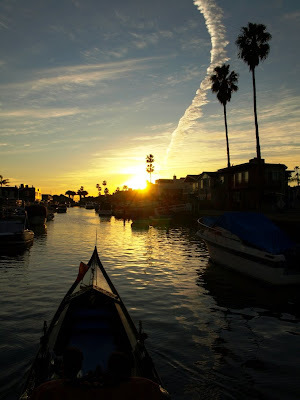 Now, the docking at Sunset Gondola isn't profoundly difficult, it was the way Tyson came in at just the right speed, spun the boat with perfect control, and just pushed the gondola into dock. Tyson and Tim will probably read this and think "what's the big deal? ", because they do it every day. 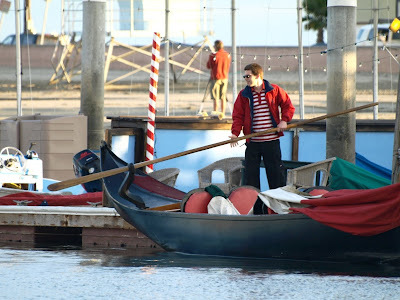 But watching it happen, Cassandra and I appreciated how "in his element" the gondolier was.